Originally I was going to post my autumn empties at the beginning of December but then, well, Christmas got in the way. Consider these my autumn-and-part-of-winter empties binstead. 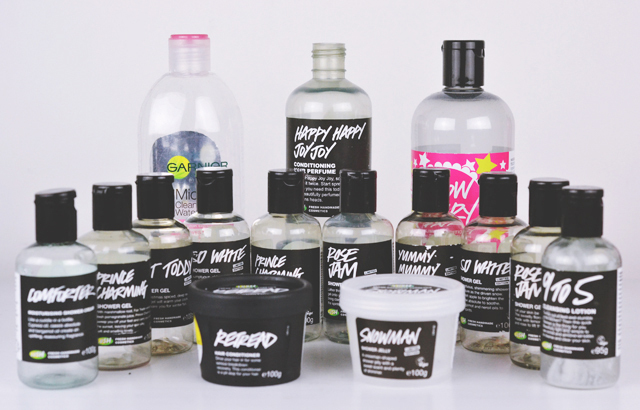 Although, to be honest, I might as well have just called them my Lush Empties. Might as well start with the sole non-Lush item. This was the first micellar water I'd used and, although I wasn't too keen on it at first, I actually much prefer it to the Nivea one I've bought to replace it. Repurchase? Maybe. I think I'll try out some other brands before I commit to this one. As you can tell from the packaging, this was a bottle left over from the previous Christmas collection. I actually finished it a couple of days before the 2015 launch so it was beautifully timed! Of course we all know about the candy-sweet pear drop fragrance and slight lustre so I won't go into all that here! Repurchase? Rich bought me one of the 1kg mega bottles of Snow Fairy for Christmas so we're all set until the end of the year now! As part of my mission to try the entire range of Lush haircare (well, the entire range of Lush, really), I popped this conditioner into my basket without a second thought. It wasn't until I got home that I realised it was approximately a thousand pounds more than the other conditioners. Turns out this is "hair perfume", which is basically just scented conditioner. Ok, ok, it does smell incredible but is it worth the extra? I'm not so sure. Repurchase? Maybe one day. It's not top of my list though. Comforter was one of the first Lush products I ever used and it's Rich's favourite so it holds a special place in my Lushie heart. When the Oxford Street store opened and I discovered they were selling a cream version of Comforter, my heart skipped a beat. It smells every bit as sweet and blackcurranty as the original and, as it's a cream rather than a gel, it's more conditioning, although the bright colour does have a tendency to stain the skin temporarily. As it turns out, I never reviewed it so I need to get on that! Repurchase? Probably, after I've used up the other 39357 shower gels I have in my bathroom. It takes me a while to use up shower gels because I have so many of them! Case in point: Prince Charming is from the 2015 Valentine's Day collection and has just been rereleased for 2016. Unfortunately, despite having two bottles, I wasn't a massive fan of this one. At first, I really liked it (as my review shows) but the more I used it, the more that joy faded. I think it was the pomegranate, but there was a very tart note that I just didn't find appealing after a while. Repurchase? No. Even though Lush have changed the formula for the new release so Prince Charming is now a cream, rather than a gel, it's not for me. I loved Hot Toddy so much! Released for Christmas 2014, it was pure festive joy- cloves, cinnamon and ginger- with glitter floating around. Everything about it felt so warm and soothing. Needless to say, I was absolutely gutted when it didn't return last year. Repurchase? I'd buy a whole vat of the stuff if they re-released it! Another 2014 Christmas product that broke my heart by not returning. I think it actually briefly appeared in the Kitchen but I wasn't fast enough to catch it. All the apple-y goodness of So White bath bomb in a bottle, this shower gel was one of my favourite Christmas releases ever. And to think I burned through 2 bottles, expecting to be able to stock up again in October. Repurchase? A million times yes. Please bring it back, Lush! Basically, I was too scared to use up my leftover Chrismas products for the first 9 months of the year in case they ran out really early, so I started using them all up in the autumn. Rose Jam is pretty much guaranteed to come back year on year but I still saved my two bottles just in case. A sweet, almost fruity rose and vanilla fragrance, it's become the epitome of Christmas. Repurchase? Of course! Luckily I stocked up on some bottles in the sale too! I'm holding out hope for the 2016 Mothers' Day collection as it was one of my favourite seasonal offerings ever. Yummy Mummy was the opposite of Prince Charming- at first I didn't like it but over time it grew on me. The tonka and geranium fragrance was pretty strong but I found using it as bubble bath made the scent mellow a little. Repurchase? Hell yeah! As long as it comes back this year, that is! As much as I adore Lush cleansers, they're just so fiddly. 9 to 5 is different- a classic cream cleanser in a bottle. I absolutely loved how quick and easy it was to you with minimal fuss and a lovely, fresh fragrance and moisturising elements. I tend to find that I use up hair products in a pot much quicker than those in a bottle for some reason, and Retread was no exception. With a strong violet fragrance and a super rich consistency, I found it was really moisturising and tamed my curls. If only it was available in bigger pots! This was the first shower jelly I ever used and it sparked a right love affair. The fragrance is, along with Rub Rub Rub, my favourite of all the ones used in Lush products. Carrot and lemon may sound like an odd combination but it's amazing- so fresh and zesty. Not only that but it's shaped like an adorable little snowman. Repurchase? You better believe I've stocked up to get me through the year! I've nearly used up a few make up products so I promise my winter empties won't all be bath stuff. I can't promise less Lush though! SO MUCH LUSH! I have to try some of them! I love the Garnier Micellar Water! 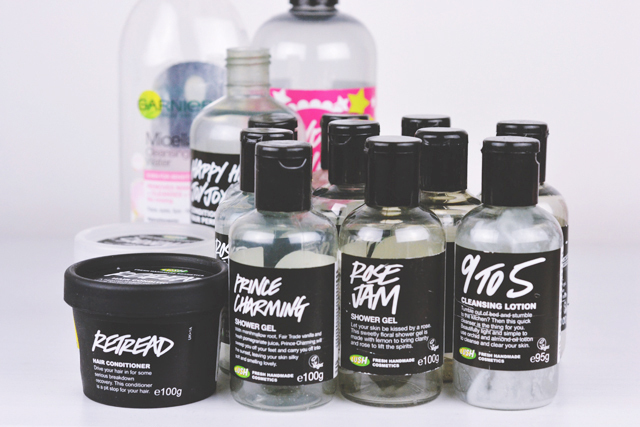 Yep, I think Lush Empties would have been a perfect title !